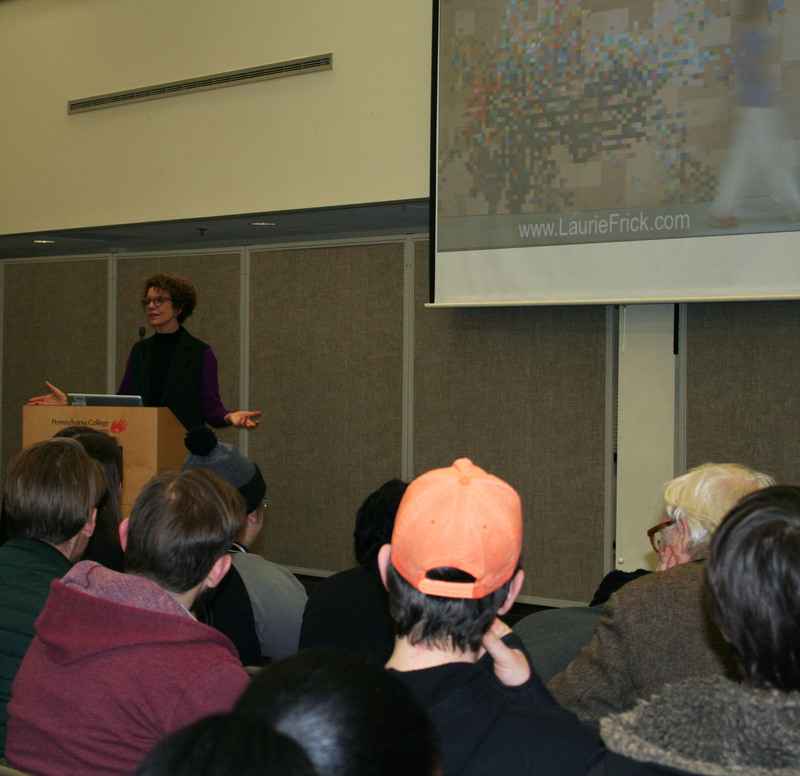 Data artist Laurie Frick, whose work is currently in the PCA&D Gallery as the exhibit The Quantified Self: The Data Doesn’t Lie with fellow data artist Katie Lewis, spoke at the college today. “Have you thought about what is known about you?” she opened her remarks. Frick, who ran technical companies before returning college to study art, said the notion of future is really curious to her, as is the study of time. 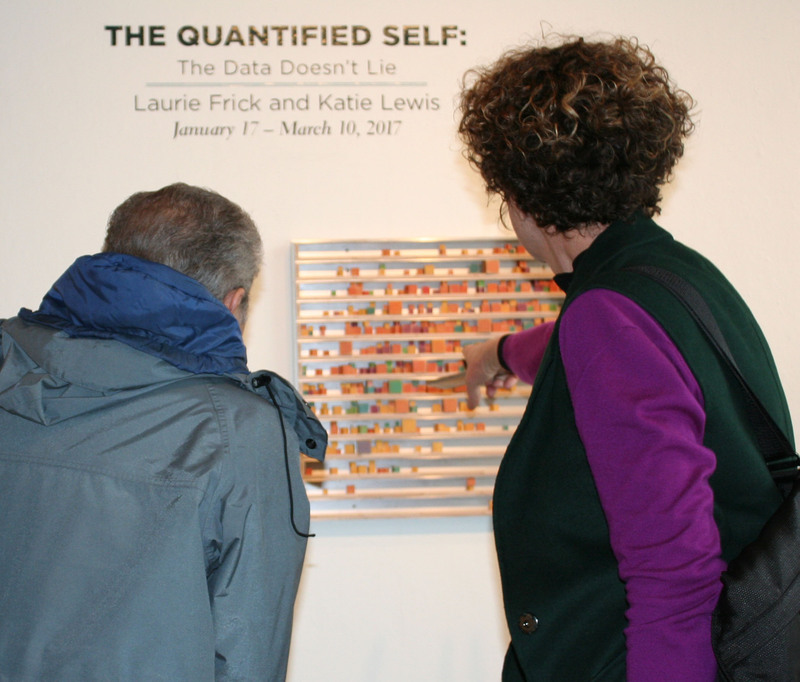 First Friday Reception for The Quantified Self exhibit is tonight, February 3, 5- 8 p.m. The exhibit will be in the gallery through March 10. PCA&D’s Spring 2017 exhibition series the College focuses on scientific and technologically inspired art work. The study of science and art via cutting edge technology is narrated through the artists’ creative practice, exemplifying the desire to know more about ourselves and our world. 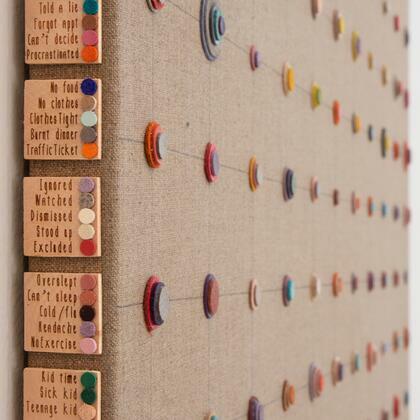 In her work, Laurie Frick translates personal data points into an expressive yet orderly representation an individual. Patterns of behavior become patterned artworks, where the mass of data simultaneously predicts an individual’s life and provides a glimpse into one’s hidden personality. Frick’s artwork depicts subjective and nuanced human action as tangible and calculated data. Frick holds an MFA from the New York Studio School, an MBA from the University of Southern California and studies at New York University’s ITP program. Frick recently was awarded residencies by Samsung Research and the Neuroscience Research Center University of Texas. Frick’s talks and publications include The Atlantic, Nature Publishing, Los Angeles Times, Haaretz, New Scientist, NPR, Creative Mornings and TEDx and more. FRICKbits ‘your data is now art on your phone’ was crowdfunded with a successful Kickstarter campaign and is now in the iPhone store. She has exhibited widely, with solo shows in New York, California and Texas. She is represented by Edward Cella gallery in Los Angeles, and Pavel Zoubok in New York. Also featured in the exhibit is the art of Katie Lewis. Lewis compiles data such as physical sensations in the body or the number of steps taken each day. 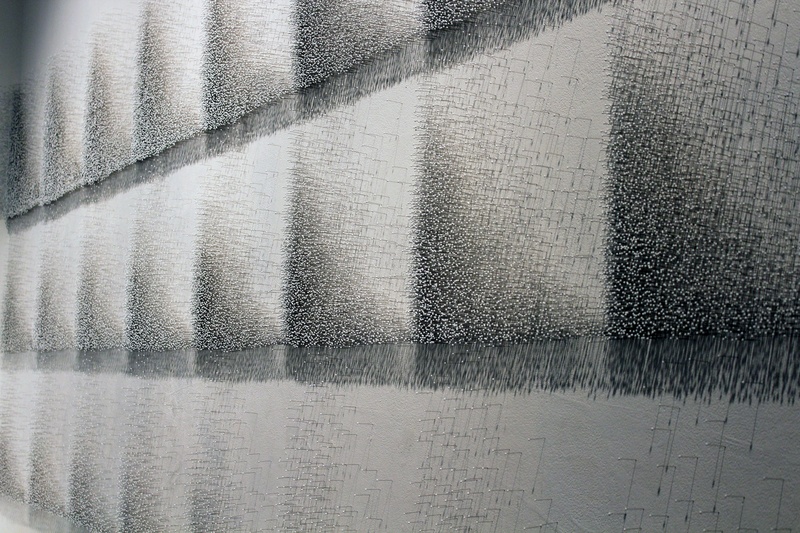 She then creates distinct forms of data visualization using materials such as paper, thread, sewing pins, or graphite. Her process is labor intensive, consisting of physical repetitions within her self-imposed constraints. Lewis works through the data until her devised system reaches its breaking point. The materials she uses no longer functions -- paper tears, walls crumble, and thread becomes an impenetrable net, transforming into visual accumulations.